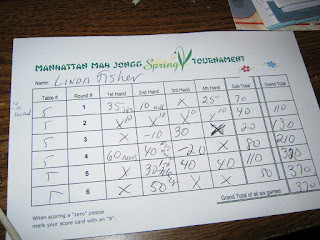 Mahjongg blog: What's the Score? I did something a while ago that I wouldn't normally do, but a friend persuaded me and I acquiesced and attended my first 14-tile tournament. Now, I won't go into detail about League rules and which is faster, which is better - hey, to each his own. I won't even complain about going dead, which I did, as expected, but only once. But what I will complain about is my score. It was -690. Yes, you heard that right, minus 690. I can't say I wasn't warned, because the director sent an email outlining all the rules and the scoring system. And from what I understand, this scoring system is starting to take hold in three states that I know of. It goes like this: When you win a hand, you get the value of the hand. Everyone else gets minus the value of the hand, and if someone gave you mahjongg, they get minus two times the value of the hand. Sound familiar? Well, it's like money. If I give you mahjongg on a 25 cent hand, I pay you 50 cents, the other two players pay you 25. If you pick it yourself, everyone gives you 50 cents. So if you play one round (four games) and you don't make a mahjongg, you could be down 200 points in the first hour. If you think of it as a purse, you have lost $2.00, but if you think of it as a tournament score, you are minus 200. I don't like it. A player told me at a recent tournament that out of three winners, one had a negative score. WTF, as the kids like to say. I wondered what my real score would have been at this tournament, but I was too depressed to figure it out. I did make mahjongg a couple of times, and there were wall games, so from my point of view I did have some points, but, they were of no consequence, and I left feeling ashamed of myself. So I am appealing to tournament directors who might be considering implementing this system. Please, please stick to the customary tournament scoring - I may not be in the running, but at least I will have retained my dignity.